5th sentence, 74th page: His gaze was too focused, too absolute, making her feel as if she were the only woman in his world. Called on a dangerous assignment, leopard shifter Conner Vega returns to the Panama rain forest of his homeland, looking every bit the civilized male. But as a member of the most lethal of the shifter tribes, he doesn’t have a civilized bone in his body. He carries the scent of a wild animal in its prime, he bears the soul-crushing sins of past kills and he’s branded with the scars of shame inflicted by the woman he betrayed. Isabeau Chandler is a Borneo shifter who’s never forgiven Conner – or forgotten him. The mating urge is still with her, and when she crosses Conner’s path, passions burn like wild-fire. But as Conner’s mission draws Isabeau closer, another betrayal lies waiting in the shadows – and it’s the most perilous and intimate one of all. Conner and Isabeau start off this story with a past relationship, so rather than being a story about first love, it’s one about gaining trust. Although I do enjoy the stories about first passions, love at first sight, and the idea of that very first courtship, sometimes it’s a nice change of pace to read about another stage in the relationship. Especially when it is a somewhat fragmented one. Somehow, the idea of betrayal and regaining trust, finding out more about someone after that initial “honeymoon period” is more engaging. It’s more real. More intense and able to draw me in. Probably because I’m in a long-term relationship, so the issues I’m facing are very different to those of first love. 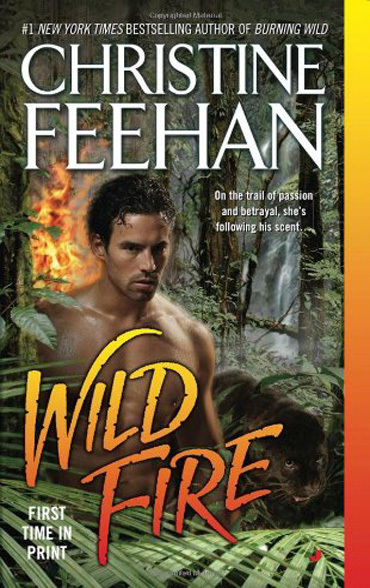 Although I enjoyed Burning Wild, I absolutely adored the setting in Wild Fire. After all, it’s set in some incredibly attractive lands of the rainforest. In Panama, a place I’ve never visited, but one my friend has assured me is absolutely stunning. The mystery of the land and the intensity of the wilderness add to the fast paced storyline as Conner and Isabeau not only fight to return to one another, but also take down a drug cartel and rescue innocent children. It’s certainly a dreamy and intense world in which Feehan transports you to.